The study, which appears in the January issue of Psychological Science, a journal of the Association for Psychological Science, was designed to show that a monkey could express its confidence in its answers to multiple-choice questions about its memory based on the amount of imaginary currency it was willing to wager. Their experiment was derived from the observation that children often make pretend bets to assert that they know the answer to some question. According to Son, "the ability to reflect on one's knowledge has always been thought of as exclusively human. We designed a task to determine if a non-human primate could similarly learn to express its confidence about its knowledge by making large or small wagers." In the experiment, two monkeys were trained to play a video game that would test their ability to remember a particular photograph while also allowing them to make a large or a small bet. Ultimately, this wager would reflect the monkey's perception of their memory accuracy. The test used touch-screen technology and a multiple-choice format. Six novel photographs were presented at the beginning of each trial, one at a time. One photograph was selected at random and then displayed simultaneously with 8 novel photographs. The monkey's task was to select the photograph that appeared at the beginning of the trial. 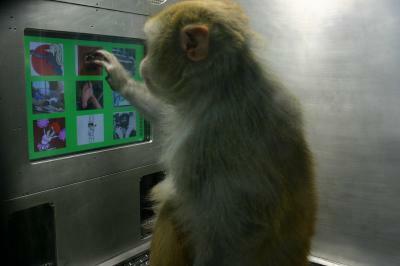 The monkey then evaluated the accuracy of its choice by selecting a high and a low-risk icon presented on the screen. It earned a large reward if it selected the high-risk icon after a correct response (3 tokens dropped into a bank displayed on the video monitor). Choosing the high-risk icon following an incorrect response resulted in the loss of 3 tokens. Low risk bets were always followed by a small reward (a gain of 1 token). When the monkey accumulated enough tokens, it was rewarded with food. The results demonstrated that with the monkeys, there was a strong correlation between high-risk bets and correct responses and between low-risk bets and incorrect responses. Terrace argues that, "the pattern of the monkeys' bets provided clear evidence of their ability to engage in meta-cognition, an ability that is all the more remarkable because monkeys lack language." But the results may have further reaching implications as well. Terrace notes "our results are of general interest because non-verbal tests of the type used in this and other experiments on animal cognition can be adapted to study cognitive abilities of infants and autistic children."